Green-minded entrepreneurs and sustainable start-ups are being urged to apply for this year’s Postcode Lotteries Green Challenge. The winner of the competition, which is open for entries until 12:00 noon on 1st of May, will win €500,000 of funding to develop their business. The runner up will win €200,000, and three other finalists will land €100,000 each. A panel of experts will choose the top five British entries, which will be put forward to an international judging panel who will select the five finalists from all over the world to pitch their ideas at the final in the Netherlands in October. Since its inception in 2007, a diverse range of environmental issues have been tackled by the companies winning and making it to the final of the prestigious competition. Last year’s winner, The Great Bubble Barrier, developed an innovative way to stop plastics polluting the ocean by using a bubble curtain to capture rubbish as it flows down rivers – without stopping ships or fish from travelling. 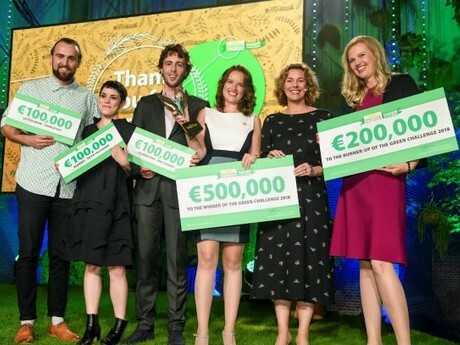 British company LettUs Grow made it to the final and won €100,000 to develop its sustainable farming business. The start-up designs efficient irrigation and farm control systems for indoor farms. These aeroponic systems deliver higher crop yields, reduce production costs and make farmers’ lives easier. The other finalists were Reverse Resources and Algiknit, using innovative approaches to tackle waste in the fashion industry, and Aqua Battery, pioneering non toxic, 100% sustainable energy storage solutions. Clara Govier, managing director at People’s Postcode Lottery, said: “As part of the Postcode Lottery family, along with our sister lotteries in the Netherlands, Sweden, Norway and Germany, we have a shared aim of creating a better world for people and the planet. Reducing our impact on the environment by tackling climate change is an important part of this aim. A minimum of 32% from every People’s Postcode Lottery ticket goes directly to good causes. To date, players of People’s Postcode Lottery have raised over £393 million for more than 5,500 good causes across Great Britain and internationally. Together with its sister lotteries, over £7 billion has been raised. For more information and to enter, please visit www.greenchallenge.info.